Late notice I know, but executive editor of Worldchanging.com (where I write nearly as infrequently as here right now!) Alex Steffen is in London at the moment and we're having a meetup of readers, potential writers and anyone else who's curious this Sunday. We'll be drinking-in-residence at the Crown on Clerkenwell Green from around 2-6, do do come along! Any questions, leave me a comment. 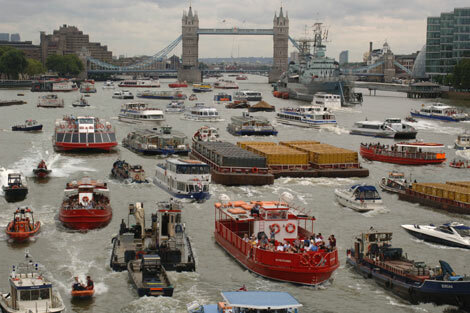 A lovely picture of all the boats to pass London Bridge in an hour, in one montage. Apparently the number of passengers transported on the river has gone up by 44% since 1999, to 2.4 million a year. Weirdly, the blogs are all linking to this via the Daily Mail (eugh). In other news, (hello, sorry for not blogging) I went to Scotland for a week of gorgeous hermit-dom; sailing (into the Atlantic, no less! Needless to say I wasn't actually *doing* the sailing), walking, eating, reading (six books: intellectual nourishment.) I will be off to the Venice Biennale in a few weeks, trying to avoid the crowds and actually enjoy being in Venice. Autumn has come to London with an unexpected Indian summer punctuated by downpours. Arsenal win in Europe and not at home.